When we talked to the four biologists that make up the unofficial regeneration "cluster" at the University of Kentucky, we learned too many interesting things to cram in the group video. So we made a short video for each of them. Here's more on Jeramiah Smith, salamanders and sea lampreys. 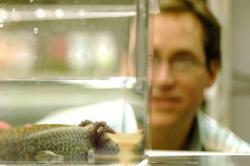 Biologist Jeramiah Smith studies salamanders and sea lamprey to find genetic clues to regeneration. Over the summer, biology students Taylor Shackleford and Sarah Whelan – who came to UK to pursue research – were given a unique opportunity to continue their lab work after spring classes came to a close. Smith's Work on Genome Sequencing Published in Prestigious "Nature Genetics"
UK Biology professor Jeramiah Smith, collaborating with scientists from 35 other institutions worldwide, was recently published in the prestigious journal Nature Genetics for his work with genome sequence of the sea lamprey. Read more about Smith's Work on Genome Sequencing Published in Prestigious "Nature Genetics"
Jeramiah Smith is a professor and researcher in the Department of Biology. Smith's research focuses on gene rearragnement, with a specific focus on the genes of Lamprey, a species of aquatic vertebrate. In this podcast, Smith explains why Lamprey DNA is important to humans and where his research is headed. This podcast was produced by Sam Burchett. At the beginning of the Fall 2011 semester, we met with all of the new faculty hires in the College of Arts and Sciences. This series of podcasts introduces them and their research interests. Jeramiah Smith is an assistant professor in the Department of Biology. Smith's area of focus is on genetics and genomics, particularly on how the genome is put together and why it occurs the way that it does. His current research projects concentrate on the lamprey genome.